Almost every major medical organization now promotes the fact that humans are healthier on a whole-foods, plant based, vegan diet than one with animal substances in it. Click here for a compilation of references, and position summary for organizations supporting this claim - organizations range from the Mayo Clinic to the Academy of Nutrition and Dietetics. BREAKING NEWS: "As many as 37% of human breast cancer cases may be attributable to exposure to bovine leukemia virus." Learn more..
Dr. Michael Greger, MD: a physician, author, and internationally recognized speaker on a number of important public health issues. All proceeds from his speaking engagements and the sale of his books and DVDs are donated to his 501(c)3 nonprofit NutritionFacts.org - a science-based, non-commercial website, where he provides free daily videos and articles on the latest discoveries in nutrition - and....he's fun to listen too! Dean Ornish, MD - A recognized leader in health, healthcare and medicine for more than 35 years. His scientific research studies have been empowering the way millions of people think about the simple lifestyle choices they make each day in dynamic relation to their health & well being. BREAKING NEWS: "As many as 37% of human breast cancer cases may be attributable to exposure to bovine leukemia virus." The Role of Diet in Preventing, Arresting, and Reversing our Top 15 Killers. Dr. Greger explains what we can do about the #1 cause of death & disability: our diet. 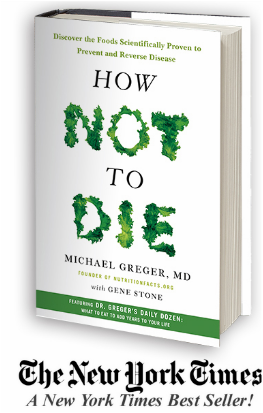 How Not to Die, an instant New York Times Best Seller, by Michael Greger, MD. It is a fantastic book and a real joy to read! Highly recommended! The audio is read by Dr. G. himself - win!